This pendant is from my latest collection inspired by my trip to Australia. It is constructed of sterling silver wire. 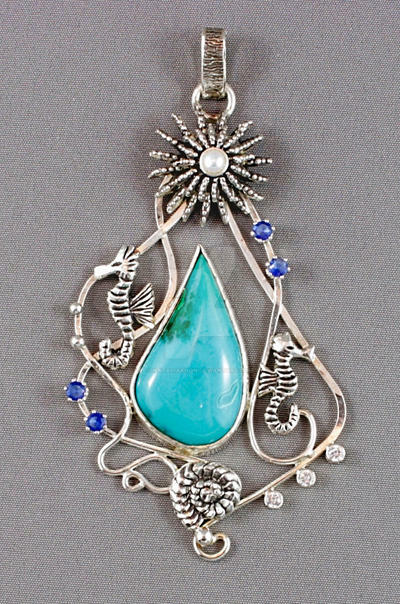 Little sea creatures (anemone, seahorse, shell) are cast and soldered on it as well as the little balls and stone settings. The stone is a beautiful drop-shaped gem silica 3cm*1,8cm (1 1/8''*1/2''). There is also 1 fresh-water pearl (3mm), 3 cubic zirconias (2,5mm) and 4 sapphire imitation stones (3mm).